The discipline of culinary arts deals with the preparation and presentation of food items. Students of culinary arts not only learn about the nutritional and dietary properties of ingredients, they are also trained on how to prepare various recipes. A Doctoral in Culinary Arts is the highest degree available in this field. Prior experience in the field and a master’s degree is required for admission in to a Doctoral in Culinary Arts. After the completion of this degree, you could work in the food industry in various positions including food critic, TV chef, gourmet chef and kitchen supervisor. How long does it take to get a Doctoral in Culinary Arts degree? A doctoral in culinary arts can take three to seven years to complete, depending on your specialization and degree requirements. This is the highest level of degree available in this field. What are the requirements to get a Doctoral in Culinary Arts degree? To complete a doctoral in culinary arts degree, you will be exposed to a variety of fundamental and advanced courses in food studies. These will cover topics such as baking and pastry making, international cooking methods, culinary entrepreneurship, culinary foundations and food safety. In addition to this coursework, you will also be required to submit a thesis or a capstone project towards the end of the program. How much can I make with a Doctoral in Culinary Arts? 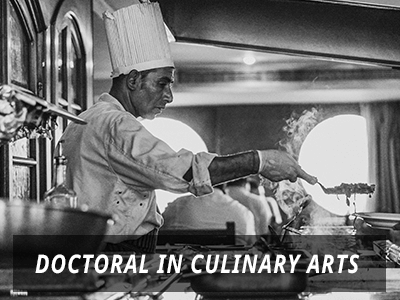 With a doctoral in culinary arts, you can pursue a variety of high paying career paths. These include jobs such as a hotel/restaurant industry executive, executive chef, nutritionist, convention director, food critic, senior manager and so on. According to BLS, Chefs and Head Cooks made an annual median income of $45,950 per year. Q:What are the career prospects if I earn a Doctoral In Culinary Arts degree? A:A doctoral degree in culinary arts is an advanced degree program in this field. It comprises of research based studies and is industry oriented. If you earn a doctoral degree in culinary arts you are eligible for a number of high paying executive jobs in this field, you can pursue job positions such as the following: hotel/restaurant industry executive, executive chef, senior manager, nutritionist, convention director, food critic, food write, etc.